Lexington, Ky. - The Blood-Horse, the nation's oldest continually-published weekly news magazine for Thoroughbred racing and breeding, will reduce its print advertising rates by 5 percent effective January 2009. The move comes in an effort to help ease the current operating burden faced by many of the country's Thoroughbred horse farms and other industry-related businesses. The Blood-Horse is the flagship publication of Blood-Horse Publications based in Lexington, Kentucky, and is a publication of the Thoroughbred Owners and Breeders Association (TOBA). With an estimated $4 billion dollar impact, the horse industry is Kentucky's top agricultural cash crop and an important business to other states such as California, New York, Florida, Texas, and Louisiana. "In the past couple of months, we've seen the dislocation between breeding costs and market prices widen into a chasm that threatens the very viability of our industry. The charter of The Blood-Horse is to serve the Thoroughbred owner and breeder, a group that needs immediate financial relief," noted Mr. Stacy V. Bearse, President and CEO of Blood-Horse Publications. "Reducing our advertising rates will provide modest relief to industry marketing budgets, while challenging us to operate more efficiently than ever. In spite of our lower pricing, readers and advertisers have my pledge to maintain the same high standards of quality and services that have characterized The Blood-Horse brand for many, many decades." The Blood-Horse advertising rate card will be adjusted to reflect the 5 percent rate reduction effective with the January 3, 2009, issue. Regular advertisers will see automatic decreases in their account statements. Blood-Horse Publications is a multimedia publishing company that traces its roots to 1916. Its flagship publication, The Blood-Horse, is a publication of the Thoroughbred Owners and Breeders Association (TOBA), and is the leading weekly Thoroughbred racing and breeding news and information magazine. In addition, Blood-Horse Publications also publishes The Blood-Horse MarketWatch, a newsletter for Thoroughbred investors; the official Kentucky Derby souvenir magazine; Auction Edge and Keeneland magazine. 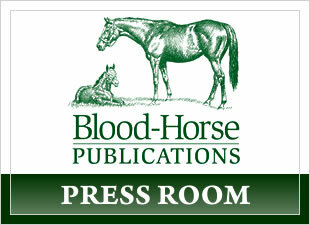 In addition, Blood-Horse Publications also publishes equine-related books and videos under the Eclipse Press banner, and operates a family of award-winning Web sites including BloodHorse.com, TheHorse.com, StallionRegister.com, ExclusivelyEquine.com, the official store of Blood-Horse Publications; and TrueNicks.com. To view up-to-the-minute news and information on the Thoroughbred industry on your mobile Internet device , visit mobile.BloodHorse.com. To receive the latest news and important information from BloodHorse.com via RSS feed, visit: BloodHorse.com/RSS. To subscribe to BloodHorse.com's breaking news alerts or free e-newsletters, visit: BloodHorse.com/enewsletters. To view/download media kit information, visit BloodHorse.com/mediakit.